Here in Texas, I can already start to feel Spring in the air, which can only mean that Easter will soon be upon us and before long, Peter Cottontail will be hopping down the bunny trail. Easter is obviously meaningful for religious reasons, but in the eyes of a child, Easter is also special because, like Christmas, Easter is full of magical surprises. What will they get from the Easter bunny in their baskets? How many eggs will they find this year? Will there be any special treats inside the eggs they find? As parents, we want our children to have a fabulous holiday, but it's important to also stay within a reasonable budget too. Thankfully, the Happy Easter Store can delight everyone with some of their special treats. Keep reading to learn more! When I first went to the Happy Easter Store to choose Easter gifts for Riley, I was instantly amazed at how cute their selections were and how reasonably priced everything was as well. Since the Happy Easter Store is sponsored by Personal Creations, most all of the items could be personalized with your child's name...for FREE! I shopped for a very long time, since I was having a hard time picking out just a few things. They had personalized Easter pillowcases, plush baskets and stuffed animals, Sesame Street themed apparel and more. Finally, I decided on the All-In-One Blue Easter Basket, the Toddler Long Johns in Pink and the Pink Wooden Easter Caddy. 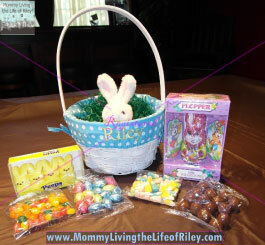 As soon as these items arrived, I knew I had made wise choices for I loved each and every one of these Easter products! 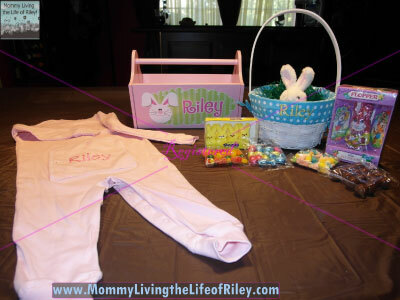 The Toddler Easter Long Johns are actually a Personal Creations exclusive! They’re made of 95% cotton, 5% polyester, and feature snaps down the front and along the legs. Of course, who can forget the cutest part...your child's embroidered name along the rear flap! These pajamas are the perfect thickness for a Spring night, one that is still a little cool, yet not cold. I know I will be laughing to myself every time I see Riley's bottom walking by in these long johns! 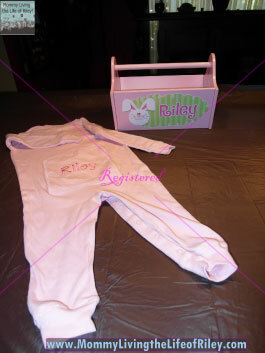 Finally, I received the Pink Wooden Easter Caddy with Riley's name on the front along with a precious cartoon bunny. Since Riley's room is painted in bright spring colors and is centered around a garden theme, I know this caddy will be a great place to store toys and books all year long. I was a little surprised when I discovered that it had to be assembled, but only because I didn't read the entire description on the website when choosing this item. It didn't take me long though, and Riley loved being my "little helper" the entire time. 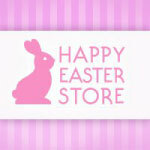 If you are looking for a way to give your child some wonderful Easter surprises while keeping your spending to a minimum, then I definitely recommend you hop on over to the Happy Easter Store. I hope you and your family have a wonderful Easter with plenty of giggles, grins and love! Disclosure: I received the three items mentioned above from the Happy Easter Store in order to facilitate my review. No other compensation was received. This product review is based on my own personal experiences with this item and is completely honest and objective.